I always enjoy it when a restaurant gives you a strong first impression walking in the door, and in the case of the Owl, it was actually two simultaneous impressions. 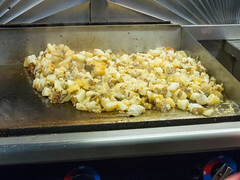 One of these was the giant griddle opposite of the door, with a giant mountain of home fries sizzling away. While in general I’m more of a hash brown person than a home fries person, when home fries are done seriously well, I rather enjoy them, and this giant grill full of them immediately made me hungry. But the other thing that happened right as I walked in the door was all four people working, including a head sticking out from the kitchen, momentarily stopped to welcome me to the Owl. This wasn’t some sort of fake-corporate welcome (like “Welcome to Moe’s”), but an actual, well-meant friendly welcome. The friendliness continued as I sat at the counter: my server was quite chatty: she realized right off the bat that I wasn’t one of the regulars, asking where I was coming from, what I was doing in Lowell, and what drew me into the Diner. And when I said that I really liked diner food, I immediately got a strong recommendation: “If you really like good diner food, then it’s really clear what you should order: order one of our Benedicts.” So, after looking at their menu, my mind was quickly made up: I’d try their Irish Benedict (with grilled CBH instead of Canadian Bacon), with a side of the home fries. I’ll start with the home fries: these were every bit as good as they looked. The outside of my home fries were perfectly crisped golden-brown, with a fair bit of crunch and more than a little butter taste (hey, I didn’t claim these were healthy! ), but not overwhelmed in grease. The insides, however, were light and fluffy without being dried out. These were pretty much the perfect expression of “home fries”, of the sort I don’t usually get since there really isn’t any way of shortcutting them: you have to start with good potatoes, par cook them to soften them, and then finish them by slowly grilling them on a griddle (like the one that greeted my arrival). You just don’t get that sort of quality with pre-cooked or deep-fried home fries. 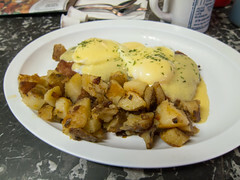 The Irish Benedict was no slouch, either. Each layer was nicely done: the eggs perfectly poached in pillowy splendor, a nice, ample layer of good corned-beef hash cooked to a crisp just as good as the home fries, a pleasantly tangy but still light Hollandaise, and an English muffin that had been griddled just to the point of starting to be crunchy. This was exactly what I want in a great Benedict, and it was nice to see each layer of it assembled perfectly. As an aside, when I mentioned to my server (a member of the family that runs the Owl) that one of my other favorite Benedicts was the thick-sliced ham Benedit at the well-regarded Dream Diner in Tyngsborough, MA up the road, I was surprised to find that the Dream Diner was opened by her daughter… So good diner fare and service definitely run in the family. 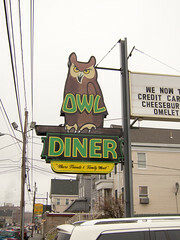 I’m hoping that another work trip to MA will allow another visit to the Owl (or it’s cousin the Dream Diner) soon, since I always enjoy a good Benedict and some great home fries. (Closed) My recent business travels had me passing through LAX on the way to Palm Desert, so I decided it would be a good opportunity to meet up with some LA friends and check out Ercole’s for burgers, based upon its AHT writeup. Unfortunately, Ercole’s doesn’t serve burgers on Monday nights since they have a MNF special (chili dogs). Fortunately, I’ve been around Manhattan Beach several times, so I decided to wander up to Ebizo’s Skewer. I’ve actually been to Ebizo’s before, it’s modest but above-average shabu-shabu joint. However, apparently since my last visit in late 2007, Ebizo’s has decided to get into the burger business as well. That’s right, burgers.